Walter Claude Flight was a British artist who pioneered and popularised the lino-cut technique, but also painted, illustrated and made wood-cuts. Flight was a fervent promoter of the lino-cut technique from the time he first used it in 1919. He felt by promoting the use of the cheap and easily obtained new material he was making it possible for the masses to be exposed to art. Flight had tried a number of different careers before settling on art. He had kept bees, farmed and also had tried engineering before studying art at Heatherley School of Fine Art from 1913–1914 later exhibiting at the Royal Academy in 1921, in Paris in 1922 and in London at the R.B.A. from 1923. He also exhibited regularly at the Redfern Gallery and abroad. Influenced by Cubism, Futurism and Vorticism, his work expressed dynamic rhythm through bold, simple forms. His linocut prints show his interest in depicting speed and movement. Flight was also a member of the Seven and Five Society in 1923 whose members included Henry Moore, Ben Nicholson and Barbara Hepworth, but it was his teaching at the Grosvenor School of Art that he is most well known for. He taught at the Grosvenor School of Modern Art from 1926, writing and organising exhibitions on linocuts. 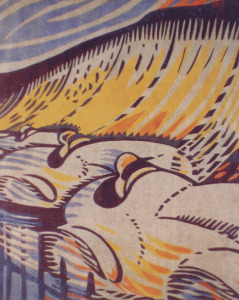 His pupils included various now-famous print artists such as Lill Tschudi, Cyril Power, Eileen Mayo and Sybil Andrews. Claude Flight produced over 64 different prints and published 9 books on linocutting.